Zirconium oxide powder,CSG00018,Zirconia Powder,China Southern Advanced Ceramic Technology Co., Ltd.
Because of its superior mechanical properties and smooth appearance, zirconia materials are now widely used in mechanical parts, electronic parts and cutting tools, to watch cases and manufacturing of optical fiber connector ferrules. Other notable applications are grinding media, and precision components. Our factory produces yttria stabilized zirconium oxide by wet-chemical process which ensures a uniform dispersion of yttria. Our strict quality control system ensures consistent quality from batch to batch, a critical point in today's final product manufacturing. Our Zirconium Powder is known for its consistent stability andquality. Our product series includemonoclinal zirconium oxide powder and zirconium oxide powder with yttria stabilized. and suitable for dry press, CIP mould, injection mould, tape casting forming and so on. ●　white solid powder with non-poisonous and non-taste. ●　enough stabilization to alkali and many kinds of acid liquor (except for H2SO4,HF and H3PO4). ●　100% monoclinic. ●　applied in mixed of electronic components material, ceramic material and padding fired. Which is particularly stabilized with 3mol% yttria, is the standard grade which can be used in various forming methods to achieve a dense sintered body with well-distributed crystalline grains. This grade of powder have a smaller surface area which contributes to a better flowability of the compound(slurry) in injection molding tape casting. For the production of large parts by mechanical press or ICP, this grad is recommended. Fully stabilized zirconia powder contains 8 mol% yttria. The sintered body is pure cubic zirconia and has high ionic conductivity. Therefore, it is used for the manufacture of sensors and solid oxide fuel cells. 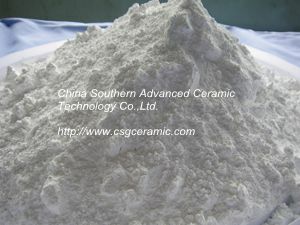 Partially and fully stabilized zirconia powder are provided. Size of powder is between 30~70μm. In the new material's research development domain, nanomaterials' research is the most active domain. As a result of the special physical chemistry performance, the products made from nanno powder had the new outstanding performance. The characteristic of company’s newborn low chlorine yttrium stable zirconium oxide powder is low surface and low strain rate. Compared with the Y-TZP material, the company newest development’s Ce-TZP material has better thermostable as well as the anti-hydrated ability because of its unique physics and the chemical properties.